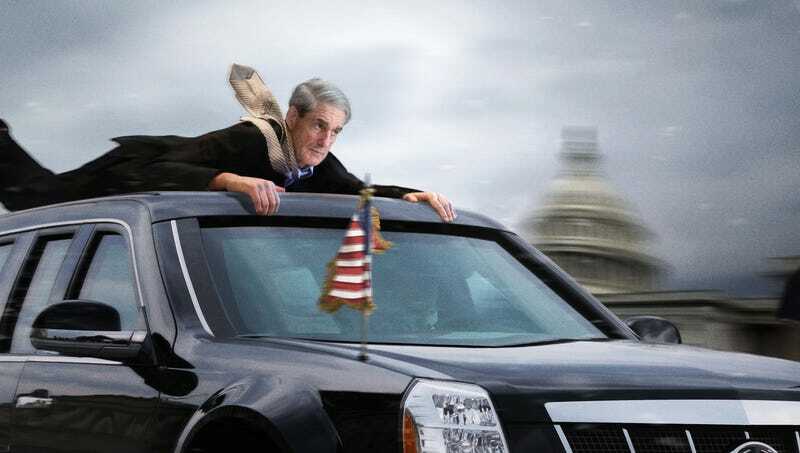 Occupants of the presidential limo thought they had thrown Robert Mueller only for the special prosecutor, who had been gripping the bumper by his fingertips alone, to clamber back onto the vehicle. WASHINGTON—Swerving hard as it sped away down Pennsylvania Avenue, President Trump’s limousine reportedly gunned it around a corner and through the streets of the nation’s capital Thursday in a frantic attempt to throw special counsel Robert Mueller from its roof. Witnesses at the scene said the 73-year-old former FBI director—who is leading the Justice Department’s ongoing investigation into the Trump campaign’s ties to Russia—relentlessly pursued the presidential limo on foot and eventually heaved himself up onto the car, trying to question the commander in chief about his contacts with foreign entities known to have interfered in the 2016 election. Sources said the driver made every effort to dislodge the special counsel, maneuvering between lanes, onto sidewalks, and through a barricaded construction zone, but Mueller managed to maintain his grip on the car, at one point clinging to a door handle with a single hand as the vehicle skidded around Dupont Circle. He was said to have appeared completely calm and expressionless as he held a written request for financial records up to the president’s tinted window, even when the limo zigzagged through the Georgetown University campus and accelerated to full speed over the Francis Scott Key bridge, sending pedestrians diving into the Potomac River. According to witnesses, when the driver hit the brakes to avoid running over a street vendor selling T-shirts, hats, and other patriotic memorabilia, Mueller was sent tumbling down onto the car’s hood, where, for the first time, the president and his men made eye contact with the prosecutor. “You’re making a big mistake, sir,” Mueller added when the driver steered the limo into an alley and attempted to pin him against a dumpster. Reports from motorists indicated that most vehicles were able to veer out of the way as the president’s car bolted through traffic, though one tractor-trailer was confirmed to have swerved into an embankment and tipped onto its side, forcing the limo to abruptly change course and drive straight through the lobby of an office tower. As the car exited the building in a shower of sparks and falling debris, Mueller reportedly emerged unscathed, continuing to issue his demands for records relating to the Trump Organization’s worldwide financial holdings. Onlookers noted that after rolling across the pavement and lying motionless for several seconds, Mueller stood up, wiped a small trickle of blood from his mouth, straightened his tie, and then slowly and calmly walked back to his office.